End of the world? Doubtful. End of the Victoria real estate market stability? Perhaps. Here's a prediction post for you to do some educated guessing. Spent a bit of time modeling the relationship between the listing price to sales price ratio (y axis bar) and month within 2011 (x axis bar). While the pending, new listings and price change ratio medians jump about quite a bit, the sum of all listings with an update on PCS exhibits an extremely strong relationship to month. A full 92% of the variability in the median list price to assessed price ratio (for the median for the entire month) is explained by the month of the year. Using the equation y = 106.14 -1.0428 x, one can see that list prices started at 106% of assessed and have dropped by 1.04% per month. Only 8% of the change in the list price to assessed price (monthly median) ratio is not explained by the chimes of the clock. Looking forward, what does this mean? Absolutely nothing of course. Unless you want it to be different here. Or prefer to see if the 7K drop per month on a 500K house continues. Here's an interesting blog post with all kinds of good, sound, expert economic analysis of the Canadian housing market data. It doesn't deal directly with Victoria, but offers some provincial analysis that we can reasonably extrapolate to the local market. Isn't a particularly pretty picture, but then again, nor has the Victoria market been a pretty picture post 2009. On a personal note, I want to thank the dedicated readership here and the contributions of the those who share data and anecdotes. This blog and its discussion is so much more because of your time and efforts. It's appreciated and you're the reason why it continues to be what it is. If it weren't for your commentary, analysis and data sharing, it would have morphed into home-updating-on-a-budget 101, which partially explains my growing absence. US home sales, for the past 5 years, seem to have been, in some cases at least, double counted. WOW. So the NAR misreported already weak home sales, on the upside. Who would have thunk it? A weak market is weaker than they tell us. Sheeeeeeeet. Early this year, the Realtors group was accused of overcounting existing homes sales, with California-based real estate analysis firm CoreLogic claiming sales could have been overstated by as much as 20 percent. Could this also be happening locally? Now don't get me wrong, I'm not making an assertion that monthly data released by local boards across the country is nefariously manipulated to misrepresent the strength of the market. I'm just asking a question: why do we put so much trust in data so jealously safeguarded against third party verification? Is the Landcorp info, or the Teranet info, enough to allow a firm like the US-based CoreLogic from exposing issues with the reported data? MLS numbers are courtesy of the VREB via Marko Juras. Numbers are for the entire board reporting area, including Gulf Islands, Sooke and Shawnigan Lake. Sales to active listings ratio: 10.7% or 9.3 MOI. We're averaging 13 sales per day. That's about a 14% drop from a rough three month daily average. Nothing too shocking considering we're at the pointy end of the annual sales slowdown. But listings are also up over 16% from this time last year--in other words, a seller's market this aint! Here's an open thread to hopefully make the comments section a little easier to navigate. I'll get back to the regular Monday market updates in a few days. Based on JustWaiting's recent daily data, it looks like daily sales volume is down significantly (35% or so). I wouldn't be too quick to say this is anything but the Holidays are looming effect; interesting trend no less. Sales volumes are so low, and have been for months, that they're more influenced than ever by unit-type and price sales mix. As people may know, as part of a master plan to take over Starbucks I’ve been collecting a few datasets on single family homes in the core areas. Since prices are generally set at the margins and since the lower margin is much more important for house prices than the upper one (i.e. house prices include a nominal lot value for which a house would sell to a builder like Marko’s dad, serving then to regenerate the housing stock). For quite a while prices at the low end of the market weren’t changing much. A house listed for 400K two years ago was listing (and selling) for 400K this year. Then fall happened. In May, out of 1050 listings, there were only 36 houses listed for under 400K. November 24, with 1008 listings on the market, there were 62 low priced beauties – or a 72% increase from May. If this is converted to dollars, the 5th percentile (95 listings out of 100 are for more money) in May was $415K, and in November this had dropped to $388K – $27,000 – 6.5%, or more than most down payments. So how does this compare over time? 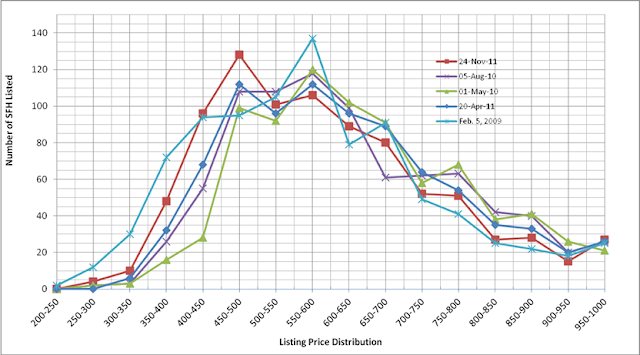 The figure below shows that there were comparatively more low end houses in February of 2009, but that since April, 2011 (the dark blue line) there is a clear drop in prices (or at least more listings) for everything under $450K. I’ll let people play around a bit to see how much. But wait, doesn’t Marko tell us that lots are still going for $330-$350K in Fernwood. Sure, the graph shows us that there are virtually no houses listed for under $350K – the change (right now) is happening from $350-$450K. Since someone will probably say that the types of houses that are listed for are changing, I’ll pull out a new data series that I’ve been collecting. Taking all houses $575K and less in price, >1,000 sq ft and in the core areas (including Central Saanich) and pulling out the area, list price, assessed price, sq. ft. and other data one can get a pretty good idea of what Mr. Market is doing without having a real estate license in good standing. Today’s post focuses on changes in the low end between May and November, so here is a scattergram/regression analysis showing the price per square foot (y axis) with the square feet of the listing (x axis). Here we can see that a 1,000 sq foot shack that would have listed for an average of $453,000 in May is now $428,000 (26K, or 5.7% less). Interestingly, there is less change as houses get larger. Could this be that the underlying lot value is dropping? Or is it because speculators have been chased out of the market by the CMHC changes? It's remarkable how day after day, 15 housing units seem to change hands in Victoria over these past few months. Consistently, steadily, eerily. 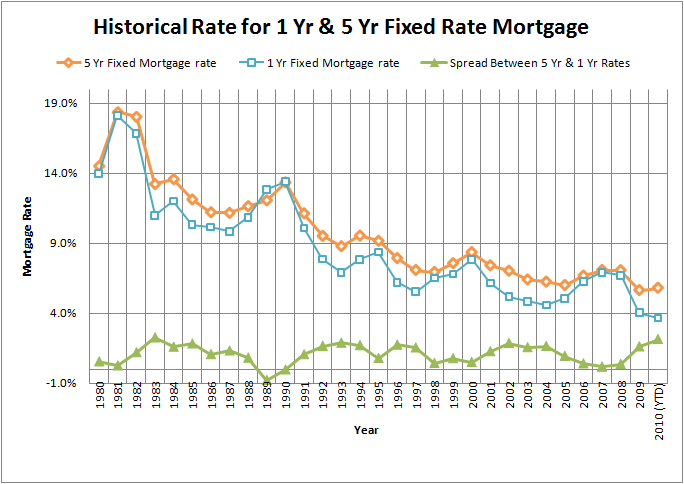 Food for thought: I bet the rental market is more active these days, too bad we don't have that data. Debate. Go. RBC released a new report today on the near-future of housing in Canada. They predict house sales volumes and prices will rise next year from coast to coast to rocky mountains. If you live on the left side of our great nation, where you've likely been told for a generation that everyone wants to be and will pay a premium to live, and for the last decade or so you've know it as The Best Place on Earth!, you should expect your home to drop in value, statistically anyway, as fewer people plunge into this over-inflated market. The average price of a detached bungalow is forecast to rise in all regions, expect [sic] B.C. alone, where prices are projected to slip by 1.7 per cent. Too late to re-think that best place slogan? How about "The best place on Earth to be a renter"? Or "The best place on Earth not to buy a home"? Or my personal favourite: "The best place on Earth to blog about real estate." For almost 3 months we've been averaging 15 unit sales per day. Which is remarkable considering this time of year is not prime buying, and therefore selling, season. Weird. Demand is exceptionally low comparatively to the past decade, but perhaps 15 unit sales a day is "the floor"? Or maybe that should read "the norm"? And if that's the case, wouldn't you shudder at the thought of being one of the 1200+ licensed agents in this town trying to feed your family and put all kinds of iGadgets under the tree in just 40 short day's time? Despite the still-high number of active listings out there, I'm not sure what's uglier: the quality of offerings or the prospects of trying to sell them quickly for "expected" prices? Monday market update: WTF Tuesday? Animal Spirit sent me the following two charts showing the breakdown of sales in each area and the average dollar value of each area. They're telling for a variety of reasons, but the standout for me is the consistency of "desirability" of some neighbourhoods over others. Month is almost over. Expect The numbers to rise rose slightly in time for tomorrow's today's end of the month report. I'll update this post with price data as soon as it's available. I'm guessing here, but we should see an average + or - $10K nearing $600K for SFH. Average prices are: $595,836 SFH, $307,329 Condos and $428,040 Townhouses. 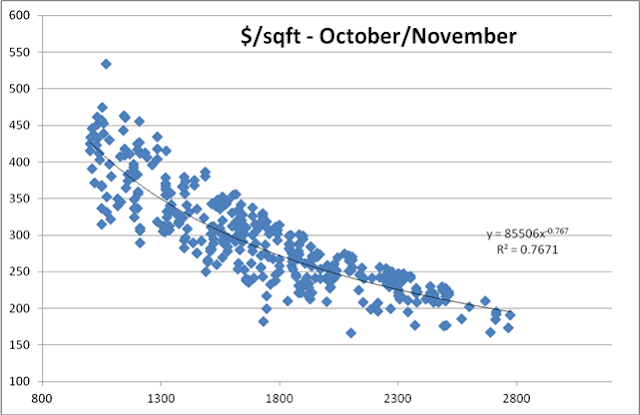 Prices are falling, inventory remains excessive for this time of year and sales volumes are low when compared against the decade average for October. Sitting on the sidelines has little downside these days (and arguably much upside). Average SFH price is currently $595K while condo average sits at $314K. These averages suggest there hasn't been a ton of buying action in the upscale market this month. I guess the 1% is nervous and doesn't want to be showing off their big earnings by buying Victoria luxury properties. Though the property transfer tax they'd pay would go a long way to addressing issues of economic inequality no? Anyway, digression over. Sales activity is higher than I'd expect for this time of year. It's still at near decade-lows, but that said, 15 unit sales per day on average is close to the summer-time numbers we saw in 2011. 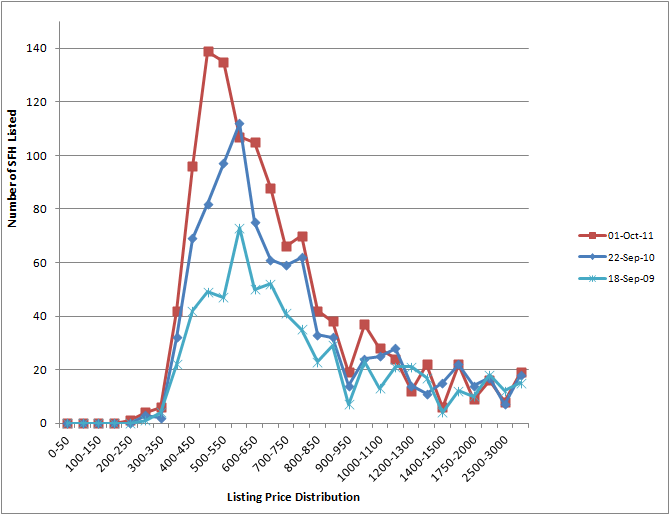 There's no upward price pressure though: look at the 4,538 active listings. Most of the 2000s spring selling seasons didn't offer buyers such copious quantities of mainly crap-quality listings! What are you seeing out there this month? You may recall this post from a couple weeks ago where Animal Spirit gave us some insight into what's happening in the low end SFH market. He's given us some more great analysis demonstrating how, despite average reported pricing being relatively flat, the median, and in reality, resale home prices are dropping, and in some cases significantly. The graph below shows you the listing prices over the past couple of years, plus a few months. Most of the analysis below is Animal Spirit's word for word. Quite striking is the run up at the higher end of the market in fall/winter of 2010, followed by an equal decline. 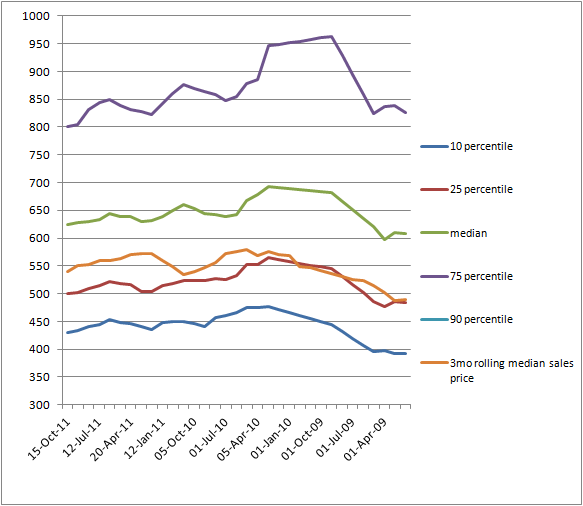 The same decline to pre-January 2009 numbers hasn’t occurred yet for the median, 25 or 10 percentile listing prices, but there is a clear downward trend since the beginning of June. Also interesting is how the median sales price tracked the 25th percentile for a year, and then diverged upwards (indicating that sales distribution became more high-end than low-end at that time). Expect the median to revert back to the 25th percentile bar at some point in the next while (bringing with it substantive, but not actual, reported drops in median sales prices). Data is not inflation adjusted. 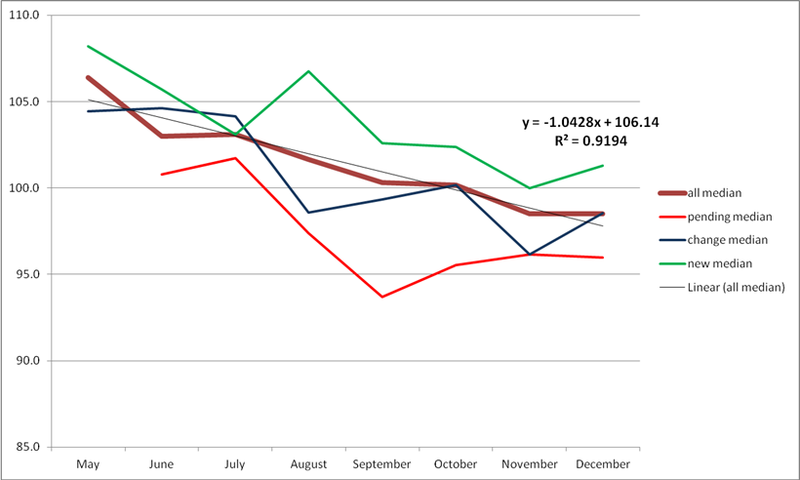 The table shows the decrease in percentile listing prices over the last year, 6 and 3 months, all annualized. Basically it shows that a person will have saved $24K by not having bought the median listed house last year. Add to this another 4K for inflation on a 20% down payment and the buyer has saved $28K by now – a pretty tidy sum. If the current trend on lower end houses continues for a year, then the 25th percentile house that list for $515,000 in July would be listing for $58,000 less (or $457,000) in a year’s time (wiping out a fair sized down payment). There is no solid proof the downward listing price trend will continue at the same pace, however with the entire distribution shifting lower, there is virtually no basis to say the price for the same house will increase. That the rolling median sales price (not inflation adjusted) is up 1% over the year while the median list price is down 5.4% shows that the relative quality of houses sold has increased rather than the actual price of the same house. In other words, people are buying a better house for the same coin. A quality Case Shiller metric in Victoria would be miles better than having to analyze percentiles from manually searched data, but this is one way to try to replicate the results. All analysis above is based on what shows up as ‘Victoria’ for a MLS search, mostly excluding the outlying areas, in particular places like Sooke where prices have likely been going down for longer. Sales and listings volumes both dropped, which is expected at this time of year. SFH average sits at $594,000 right now. We're entering the winter doldrums in an already dreary Victoria real estate market. I suspect the gift-focus this holiday season to be a little less consumerist and a little more focused on 'gifts from the heart' primarily out of necessity rather than desire. We're averaging 13 unit sales per day, including a three day weekend in there. Low, high or about right for this time of year? Resilient seems to be the word best to describe this market these days--if you focus on average reported prices only. The truth is anything but. With abnormally high inventory for October, and sales volumes at decade-lows, there is significant pressure towards lower prices, and zero pronouncements from industry players calling for higher prices. Currently there are 51 SFH homes for sale on Bear Mountain (BM). In the month of September two homes sold so we have about two years of inventory up there. Why are there so many homes for sale? Pretty simple really: people built or bought on speculation to make a quick buck. You don’t see homes for sale very often in a development like Gordon Point (much smaller). Why? Because people built homes to live there. The SFH market peaked on BM in early 2008 with homes like 2192 Nicklaus Drive selling for $1,200,000 and 1289 Rockhampton for $1,000,000. Both are likely worth south of $900,000 now. 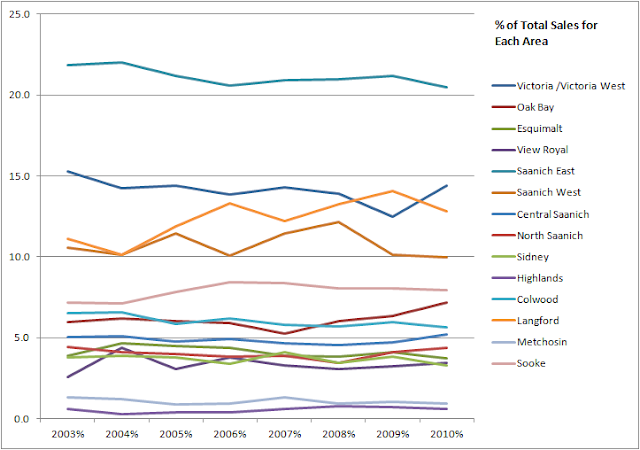 2009 brought a dire market throughout Greater Victoria including BM; however, while most of the market has come off the 2009 lows, BM continues to set new lows. So where will prices on BM head? In the case of a flat market, probably down. Remember the hype around Broadmead 15 years ago? No one talks about Broadmead anymore but it does have a decent location; whereas, BM does not. As the homes on BM age they will depreciate and as heating costs increase, which they will, owning a 4,000 sq/ft home on top of a mountain all of a sudden becomes a lot less desirable. Where do you see Bear Mountain in 15 years from now? This is part two in our Bear Mountain series from an anonymous contributor; once again sales data was fact-checked for accuracy. 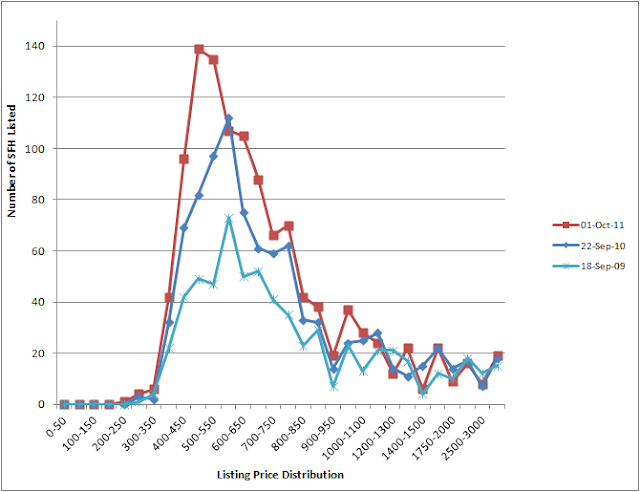 The chart shows the distribution of listings by price bracket on the dates indicated at right. It's not a complete listing snapshot, rather it's isolated to what most of us would call Victoria--that is, it excludes the penninsula, Sooke, Malahat and Langford etc. The chart clearly demonstrates that there has been a significant year-over-year listings spike in the so-called low-end of the SFH market. Two things could be happening here: there's simply more low-end listings on the market or, and I'm more inclined to lean this way, those houses that used to sell between $500K and $600K are coming on the market for under $500K these days. Ben Rabidoux, the economist author over at The Economic Analyst, has been filling the interwebs with quality analysis of the Canadian housing market for a while now. And today he hits another one out of the park with his post titled House prices and rents: Why they should track each other and why it should concern us that they haven't. All of the usual factors that people tend to associate with rising house prices, namely rising population, income growth, limited supply, and the general desirability of a particular city or area, should affect the price of renting a home as well as buying a comparable home. There are two main factors that can cause the value of a house to rise faster than the rents that a comparable dwelling would command... cheap and readily available credit... [and] ...what economists call the ‘ownership premium’. The main point to understand is that a house is ‘worth’ either the sum of its future rents (for the investor) or the sum of the rents saved by the owner of the house, discounted for future inflation and an expected return. So rents do matter. 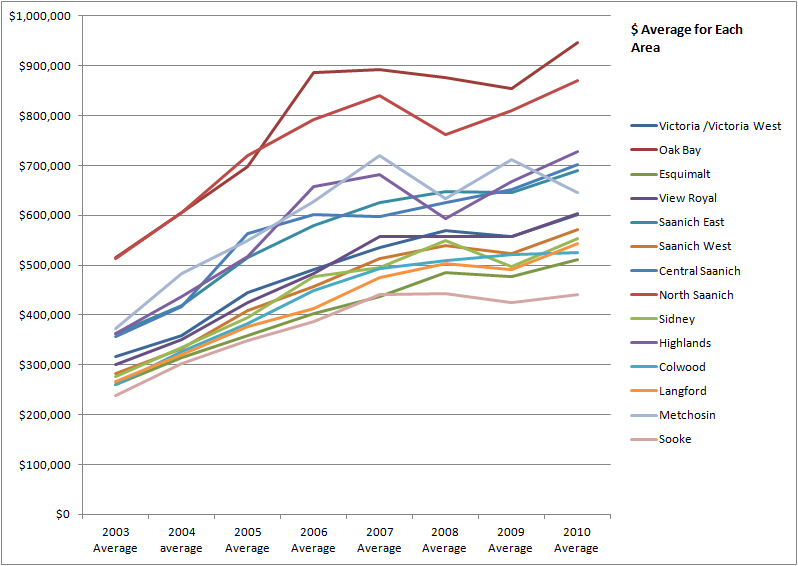 What does the gap between current rents and house prices look like in Victoria today? The Bear Mountain development, brainchild of Len Barrie, a former NHL hockey player, along with several other NHL players acting as investors, broke ground in 2005. The original $2.1 billion plan called for 1,112 single-family homes, 1,997 condos, 220 townhouses and more than 1,000 fractional-ownership town homes. Early in the last real estate boom, the development received country-wide attention and was even mentioned in the New York Times. By 2006 several condominium buildings were under way and many more had been approved, including the 20-storey Soaring Peaks and 14-storey Highlander (started but never finished). In 2006, the Bear Mountain sales team set a record for condo sales in one day with $66 million worth of units sold! In 2007, Vancouver-based development company Quigg announced plans for 45-, 39-,33- and 27-storey towers--these plans stalled in 2008 due to the economic downturn. 2007 and 2008 were also the years that condo prices on the mountain hit their peak. *The above post was contributed by an anonymous reader. Sales data was fact-checked for accuracy. Call it craziness, but those funny folks over at Microsoft's MSN.ca think there are six cities in Canada with more attractive people, places and things than Best Place in Canada™ Victoria. And I thought blue-hair was the new black? A favourite argument of the ever-increasing-Victoria-home-price crowd is the desirability of Victoria in the minds of too-many-to-count, from-away Canadians. "Everyone wants to live here." "We have the mildest climate in Canada." "We're in a rain shadow!" All of which are subjective statements only partially grounded in comparable truth. Victoria might be in a rain shadow, but it still has miserable months of endless grey in the winter time, four of them, from November to February, that chase many a snowbird to sunnier climes for a desperate dose of natural Vitamin D.
It's funny, when we compare the most beautiful cities as ranked by MSN to the most expensive cities as ranked by MSN, you'd expect, if the argument that beautiful equates to people willing to pay more to live there, that places more beautiful than Victoria would also cost more. It ain't so though. Victoria is the seventh most beautiful city, yet the second most expensive. There must be something missing in that argument to justify high home prices then outside the beauty. It must be livability; or maybe not, as MoneySense, a magazine that factors in costs relative to incomes/opportunities etc, ranks Victoria 8th on their list, behind places like Brandon, Manitoba and Fredericton, New Brunswick, yes, New Brunswick. Now I know, I know, using MoneySense to fight an argument originally supported by MSN is like saying these apples aren't as nice as these oranges. I tried to find an MSN article, but the one I found didn't have Victoria on it. But of course, it also contained the qualifying word "Next" so I'm sure Victoria was omitted primarily because it must be included on the original list. Funny though, CBC has an article and poll up about Canada's most livable cities, including such desirable locales as Yellowknife and Winnipeg, but it leaves Victoria off it's list entirely. Now I know, some of you who think the sun shines out from underneath the soon to be rebuilt Johnson Street Bridge will lambaste my "arguments" in the comments as pure hogwash. Which is perfectly fine. I chose to fight fire with fire on this little topic. When you want to dig up some population growth, household formation, housing start and demographic data to support the claim that "desirability" is higher in Victoria than elsewhere, that land constraints are actually leading to a reduction in available supply creating a supply/demand imbalance supporting escalating prices (isolated from other factors like interest rates, incomes and the looming demographic purge of real estate), we can move on from tripe-filled, spurious arguments about local real estate valuations. Daily sales volume is averaging 13 units per day... a noticeable drop from last month's 16-17 units per day average. This is remarkable as the typically industry spin usually tells us the market picks up again once the summer buying doldrums end. Am I the only one noticing the absence of that line? Seems steady-as-she-goes is the new buy-now-or-be-priced-out-forever. There are only two truths in the Victoria market right now: sales are low and inventory is high. This just happens to be my age cohort. How in the name of all that is good in this world could anyone of my generation not know that interest rates have been on the steady decline for almost 30 years? Even if they've been smoking too much herb, they'd have to be completely oblivious to not know that rates dropped drastically just over the past few years. When asked how today's interest rates compared to historical norms, more than one in three Canadians aged 30-39 incorrectly responded that today's rates were about average or relatively high. Emphasis mine. I think the only thing "relatively high" are 1/3rd of Canadian homeowners between the ages of 30 and 39, which, coincidentally happens to be the age range of the bulk of first time home buyers in Victoria. Coincidence? I'll let you decide. While there is no expectation we'll see rates like those of the 1980s, a rise of even a few percentage points could have a significant financial impact on this younger generation of Canadians. The effect of a "few percentage points" rise in interest rates will very likely be catastrophic considering more than one in two Canadians are living pay cheque to pay cheque. The rest of the release reads like an advertisement for a Manulife One account, if you know what that is, and odds are at least 1:3 that readers don't. Regardless, I'd like to say these results are shocking, except they're not. The evidence of stupid consumers is all around us. I guess the message that Canadian lenders are prudent and conservative has had the unintended consequence for one-third of us believing that means they'll take care of us and we don't need to learn anything basic about money ourselves. Further reading: Ben, over at The Economic Analyst linked to this Irish Times article: Canada's Northern Tiger looks very like a bubble. Not that Ireland would know anything about real estate bubbles. Time to pull the ejection seat? Holy Hannah batman, I can't recall the last time we saw 316 listings hit the market in one week in any September. For every housing unit sold in Victoria so far this month, four have been put on the market. If the trend continues (likely won't as listings tend to be front of the month heavy) we could see around 1400 new listings offered. 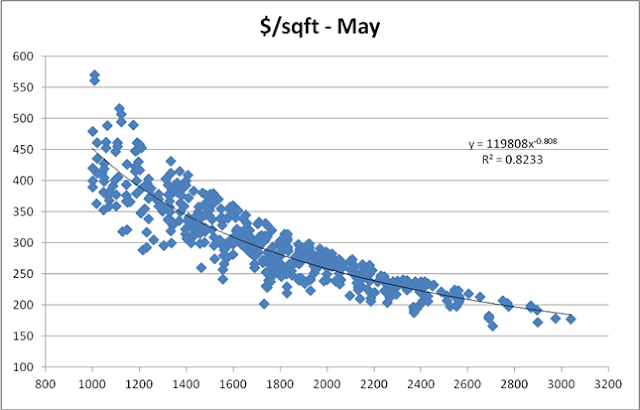 Those are height of the spring selling season (April/May/June) type numbers. What gives? Panic selling? We won't know till we have more data. But I'd hesitate to call this kind of listings dump normal activity for early September. No bones about it. September 2011 is off to a slow start. Yes, there's a long weekend in there. Regardless, 10 unit sales per day is a drop of nearly 40% from the averages we've witnessed over the past couple of months. It won't continue thought. Sales numbers will rise, even if slightly. I say this with confidence because this first "week" was really a holiday weekend. 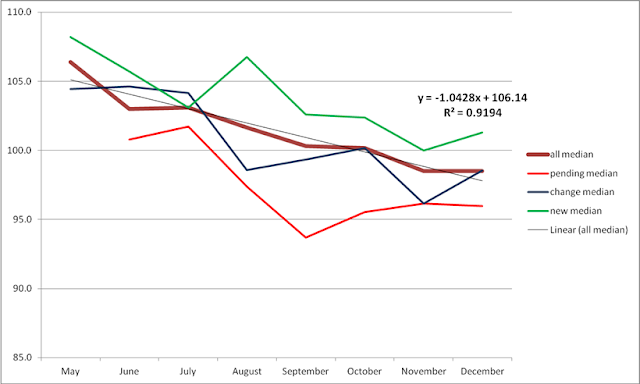 Will September be a good or bad month for local real estate sales? I'm guessing more of the same. Slow sales with a glut of overpriced, crap-quality inventory. There are a few deals to be found in some segments... as long as you define deal as "priced lower than this time last year" and you ignore the fundamentals of price to rent and price to income ratios. If you compare the year-over-year numbers, we're looking at a sales volume gain of nearly 22%. Month-over-month, we're looking at a modest gain of only 2.8%, or basically a flat market. It's interesting that over the first 28 days of the month, daily sales volume was about 16.5 units; then suddenly in 3 days, we see a "spike" to 24.3 units per day. Strange. The SFH average reported price will be in the $650,000 range. I think happy hour will start around 11:30AM for the communications team, along with their friends at the TC, today. These are the kind of days they live for: press releases like the one you'll see in about 3 hours time write themselves and require no editing. Just cut, paste and hit Upload! Badaboom badabing, now we're drinking pints on the patio in the summer sun. And it's only Thursday before the long weekend. Truths. Much needed but rarely told in the Victoria real estate market.